2) As federal tobacco taxes become more and more burdensome, some manufacturers are turning to a “loophole” to keep prices down. The Wall Street Journal reports that makers of small, machine-made cigars are slightly increasing the weight of their products to qualify them as “large cigars,” which are taxed less. Congress is investigating this practice as tax evasion. 3) Inside the Industry: La Palina is introducing a Family Series that will retail for $18-23 per cigar. Cusano has moved into Davidoff USA’s new headquarters outside Tampa, and Camacho will be following soon. 4) Around the Blogs: Smoking Stogie smokes a Viaje Skull and Bones. Nice Tight Ash checks out the Cain F. Cigar Fan fires up a Cuba Caiman. A Cigar Smoker smokes a Dirty Rat. 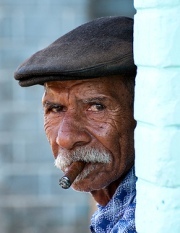 Cigar Inspector inspects a CAO Colombia. 5) Deal of the Week: This unpublicized email special features some of our favorite Cuban Crafters cigars. Included are the highly-rated Miami Medina 1959 Lanceros and the Cuban Crafters Cabinet Selection. Grab yours here.